Export the materials for the current WWMT model (if one is set). Identical to the Export VTFs in the Model & Basic QC rollout. For more details see Texture Export. This button launched the Material Library Generator. The buttons listed below work on multiple objects in the scene. They do not need to have a WWMT model set in the UI. This will create a WWMT for each object in the current selection. This is handy if you have multiple objects in the scene that you want to convert into WWMT objects in one pass. You can set some of the properties of the selected items by checking/unchecking the options in the Generate box above the Quick WWMT button. The Model Names are derived from the object names. You can tweak the values of specific WWMT helpers by picking with the WWMT UI. WWMT helpers generated with this function will have the Local Origin and Flip settings that are set in the two checkboxes above the Quick WWMT button. Pressing the little arrow buttons next to each checkbox will set all the selected WWMT helpers to use that checkbox's value for the model's corresponding setting. For example, if you check the $staticprop checkbox and then the button next to it, all selcted WWMT helpers will turn on/off the $staticprop value depending on the checkbox setting. This button will export/compile all selected WWMT models. 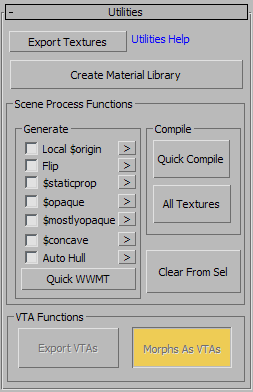 This button will compile all textures in all relevant material maps of all materials belonging to all objects in the current selection that are also WWMT models. *These items are only deleted if they have been created. No geometry will get deleted, including geometry generated by WWMT. This means that LODs, Collision Hulls and any other geometry that was part of the WWMT construct will still be in the scene. This section is for VTA exporting. When Morphs as VTA is on, the exporter will create VTA files for any mesh that has a Morpher or Morph-o-Matic modifier. Read more about exporting VTA and Facial Animations.